Approximately 1400 out of every 100,000 people will suffer ocular trauma (trauma to the eye) during their lifetime. Eye injuries can range from scratches to severely debilitating injuries. If you have sustained an eye injury due to someone else’s negligence, call an eye injury lawyer that Texans have trusted since 1979 to help them obtain the justice they deserve. Call: 800-298-0111. Corneal abrasions may be very minor or they may be very serious. Permanent damage can result from glass being left in an eye and not properly and safely removed. It is important to rinse with a proper eyewash if you suspect there is debris in your eye after any sort of accident. You should seek immediate medical attention for this type of injury. While fairly self-explanatory, the loss of one or both eyes and/or the loss of vision due to traumatic injury is a serious injury. Loss of an eye due to trauma is typically extremely painful and can be the result of a direct blow, chemical burns, fire burns or numerous other causes. If you have lost vision due to an accident that someone else caused, you need a attorney who will fight for not just your past losses, but the long-term lifetime effects this will have on your ability to work, provide for your family, drive and carry out your normal routine tasks. If you have suffered an eye loss or blindness due to an accident, please call Simmons and Fletcher, P.C. at once for a free consultation. We take your loss seriously. Traumatic iritis is swelling in the part of the eye that surrounds the pupil. It is a common result of direct eye trauma but should be taken seriously because it can result in permanent vision loss if ignored. Immediate medical care should be sought if you have sustained this injury. Subconjunctival hemorrhage is a rupture of the little blood vessels covering the white area of the eye. It often makes the white space looks near solid red. While this condition itself is not serious, it may mask and/or be a symptom of other more dangerous conditions such as a ruptured globe. You should consult an eye doctor at a minimum if not seek emergency care to be safe. A open globe injury or ruptured globe is a full-thickness injury to the cornea or sclera (or both). This injury is common from an object being jammed into the eye with either hard blunt force or penetrating force. This is a condition necessitating emergency medical care by an opthamologist immediately. Surgery may be needed. Hyphema is bleeding in the space between the cornea and the iris. This is a serious medical condition requiring emergency care. Retinal detachment is not a common injury from trauma, but we have seen traumatic retinal detachment in cases where someone’s face was slammed into a steering wheel. Immediate medical care should be sought for this. 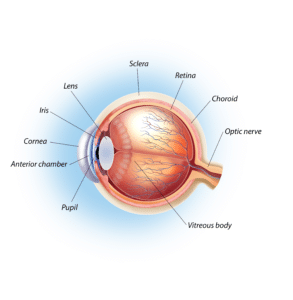 A detached lens refers to an eye injury where the eye lens is detached from the eye. This sometimes presents as a red eye or a cloudy or odd-shaped pupil. It is sometimes accompanied by eye pain, decreased vision and/or double-vision. This type of injury is a common blunt force trauma injury and can lead to more serious conditions such as a detached retina if it goes untreated. Immediate medical care from an emergency room should be sought if this is suspected. An Orbital hematoma is essentially a blood clot behind the eye. Direct blunt force trauma to the eye can result in bleeding behind the eye which, if not addressed surgically within 90 minutes can result in severe compression of the optic nerve and cause permanent vision loss and/or blindness. Decompression surgery is absolutely necessary. Thus, persons suffering this type of injury need to be transported to a trauma room emergency center at once. 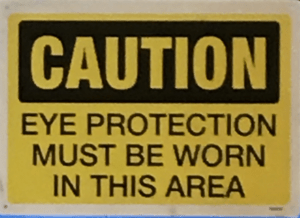 Cautions signs like this one can be found in some work areas with high risk of eye injury. Chemical burns to the eye are sadly a common injury in the Houston area due to the high number of chemical plants in the surrounding areas. Chemical injuries to the eyes are severe and can have long-term effects. Some of the effects are immediate while others are long-term degeneration. If you sustain a chemical injury to your eyes, you should seek emergency medical care at once. Most job sites that work around chemicals have a eye-flush station which can also be utilized when safe to do so while awaiting emergency transport. If you have suffered an injury to one or both of your eyes as a result of blunt force or penetrating trauma that was caused by someone else’s negligence, contact Simmons and Fletcher, P.C. for a free consultation with an eye injury attorney who can help. We are a personal injury law firm handling claims on behalf of injured victims exclusively. We zealously advocate our clients’ rights to seek the maximum compensation allowed by the law when we take on a case. Call us today for a free consultation: 800-298-0111.